Home cooking is one way to show your love. Caring for a cat with kidney disease is emotionally draining. However, cooking homemade foods for them can boost nutritional intake, offer tempting flavors, and strengthen your bond. 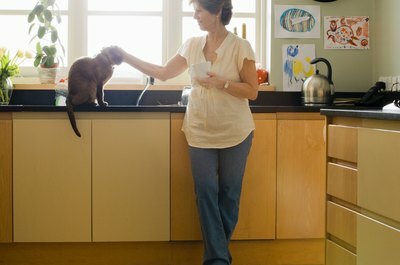 Cat parents who choose home cooking can also use specific foods to help bolster their cats' immunity. Genetic defects, tumors, infections, persistent inflammation and toxins are among the factors that may cause kidney disease. The disease prevents the kidneys' ability to filter and remove wastes from the blood. As a result, waste builds up in the blood, leading to illness, often accompanied by symptoms including increased thirst and urination, poor appetite, weight loss, dehydration, lethargy, vomiting, and mouth sores. However, these symptoms needn't be present; sometimes kidney disease creeps up over time, with few or no symptoms. Although some causes, like genetic defects, can't be remedied some can be addressed. One is toxic exposure. Diet can play a pivotal role here, as cat parents can remove toxic foods from their cats' diets, replace them with foods that limit stress to the kidneys. Food stressors to the kidneys include preservatives, chemicals, flavor enhancers and other ingredients cats can't process. Cats are carnivores, and their diets naturally revolve around meats. This may seem tricky in the case of kidney disease, because kidney diets are generally low in protein as well as phosphorous, a component found in proteins. To strike a balance, choose leaner cuts of poultry, fish, lamb or other meats over fattier versions, as leaner cuts are lower in phosphorous. Experiment with different varieties of fish or meat in a little oil, till you find options your cat likes. Certain oils have beneficial properties such as boosting immunity and fighting inflammation. Polyunsatured fats may also benefit renal failure patients. Immune-boosting, inflammation-fighting oils include those with omega-3 like flax and wild salmon. Oils with polyunsaturated fat also include flax oil and many fish oils including salmon and sardine. Try drizzling any of these oils on a plate or your finger for sampling. Over time, you will learn what your kitty prefers. Turkey and chicken fats also contain some polyunsatured fats. Normally, cats need anywhere from 150-350 calories, depending on weight and age. However, in this case your cat will need all the nutrition he can get. Try to get his normal calorie count into his body, but if he's rejecting certain foods, keep trying with different lean meats, fish and healthy oils. Your cat will need extra fluids, so offer broths with water and tuna or salmon juice, chicken broth or other flavors. Gently warming foods also increases palatability. Can Tuna Fish Cause CRF in Cats?